As part of my March, 2007, trip through Egypt and Jordan, I was fortunate enough to travel through Wadi Rum. Wadi Rum in Southern Jordan is a desert region of sandy valleys and dramatic sandstone and granite mountains some over 1700 metres in height. Covering an area of 720 square kilometres, there has been human habitation here for thousands of years, UNESCO recognizing its cultural significance by adding it to the World Heritage List. The location has also been the setting for several movies notably David Lean's "Lawrence of Arabia" filmed in 1962. Lawrence achieved fame during World War One by helping to organize and lead an Arab revolt against the Turkish army. 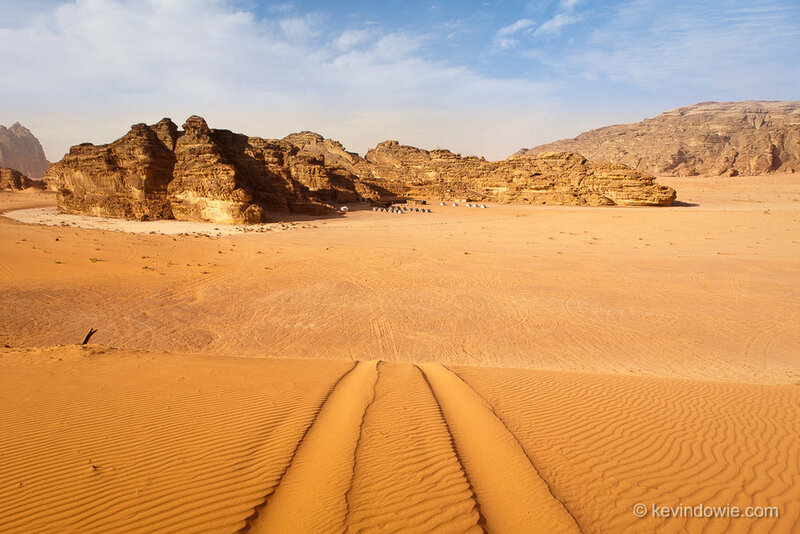 There are numerous references to Wadi Rum in the movie and in Lawrence's book "The Seven Pillars of Wisdom". There are several locations within Wadi Rum that make reference to Lawrence but whether he had any actual attachment or involvement to those specific places isn't really clear. One of the things you can do is stay overnight in a Bedouin tented camp in the desert which I did. Access into the area is by four wheel drive vehicle. The image presented here shows the 'road into one of these camps and obviously required me climbing up one of the high sand dunes to get it. For more Egypt-Jordan pictures, check out the Egypt-Jordan gallery. ~KD.